ISTANBUL, Turkey – Turkish Radio and Television Corporation (TRT) is the national public broadcaster of Turkey, and broadcasts its TV programming around the world, offering more than 14 regional, national and international radio stations including the Voice of Turkey. TRT has relied on HARMAN’s Studer consoles since the 1980s and recently upgraded its Izmir Radio Studios with a Studer Vista 9 digital console. Izmir Radio Studios purchased a Vista 9 console from Turkish Studer distributor SF Dis Ticaret Koll.Sti. The Vista 9 has four bays and 40 faders, with the faders configured as 30 for source inputs, 10 VCA groups plus two masters. The console provides 32 mic inputs, 24 AES inputs, 24 AES outputs, 80 line ins, 64 line outs and 16 general purpose in/outs. In addition, Izmir Radio bought a host of additional HARMAN Professional components including AKG mics and headsets, dbx equalizers, Crown amplifiers, a Lexicon®reverb unit, JBL studio monitors and Soundcraft mixers. 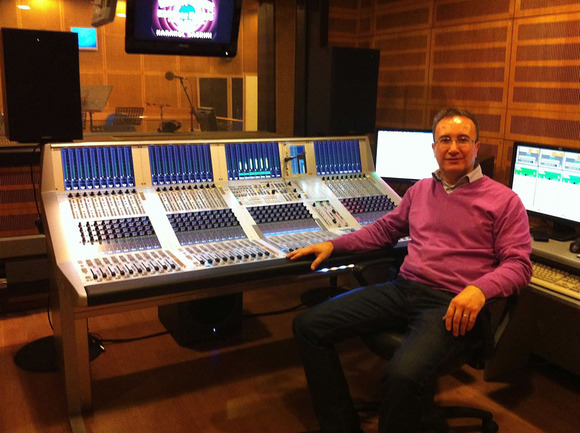 Photo Caption 1: Erkan Gökceli with the Studer 902 console at Izmir Radio Studios. Photo Caption 2: Erkan Gökceli with the new Studer Vista 9 digital mixing console.